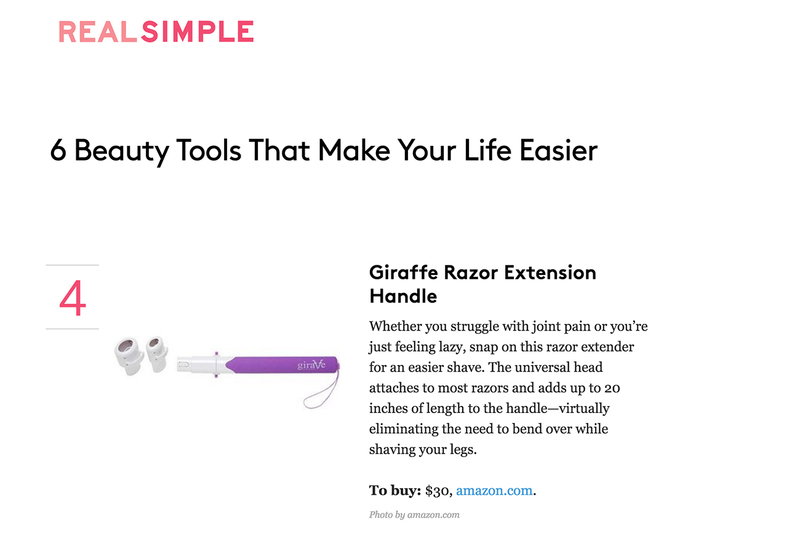 Congratulations to our Client Giraffe Bath & Body for their feature on Real Simple! There are millions of women each year who are unable to shave their legs due to the discomfort of symptoms associated with a chronic medical condition or the postoperative phase of hip and knee replacement surgery and the third-trimester of pregnancy. All of these conditions decrease flexibility and mobility and therefore, make shaving difficult if not impossible with a short-handled razor. As a consequence, some women just “give up” on shaving their legs entirely or resort to a caregiver or loved one to carry out this personal daily care routine. There is now an option for these women to shave their legs independently with comfort and safety. Introducing the Giraffe Razor Extension Handle, a shaving accessory designed to customize the length and angle of your premium disposable or reusable razor. Check them out at giraffebathandbody.com!